It must have hurt but Taylor Swift showed no sign that it did. The singer fell on stage while performing at MetLife Stadium in East Rutherford, New Jersey but she just laughed it off and went on with her number like a seasoned pro. A fan was able to record the incident on video. The clip shows the Grammy winner slipping and falling right on her bottom. Laughing, Taylor pops right back up and finished her song superbly. It rained hard that night in the outdoor venue of the concert. 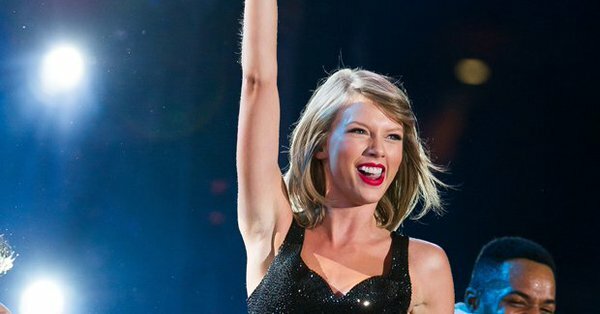 Social media users who reacted to the Twitter post with the clip of Taylor’s fall are divided: some say the singer was cute and handled it well. Others say she was “rude” and “cruel” by taking it out on her dancer when she shoved him after getting up. I guess we will find out what kind of person she is at her next show. We will see if the dancer returns!